I am so excited! We visited Jaycotts.co.uk on Friday and I came away with a brand new overlocker. I am thoroughly delighted with it and wanted to share my first look at it with you. 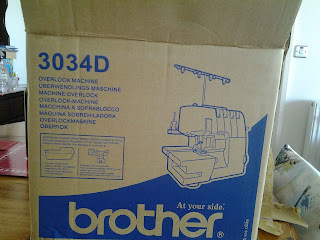 It's a Brother 3034D and it is available from Jaycotts.co.uk. 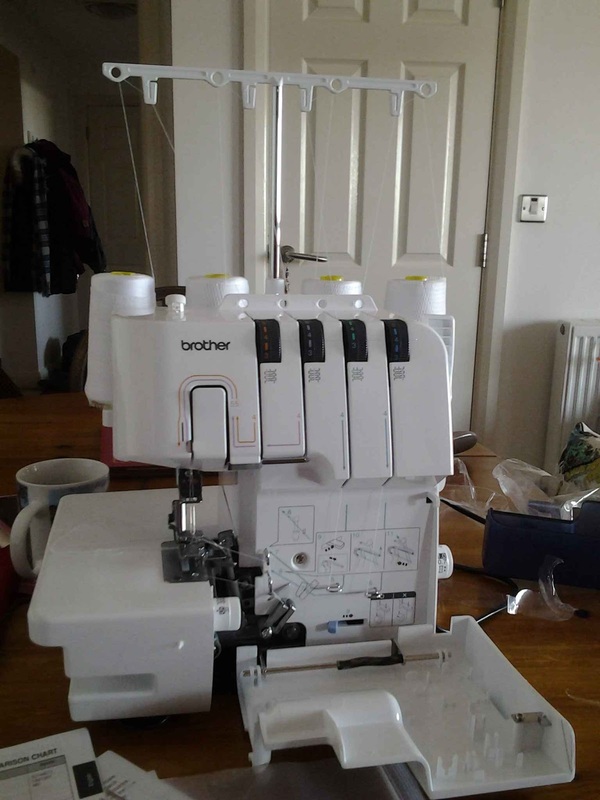 To look at it on the web site click the link HERE To get the current price telephone them on 01244 394 099 and mention that you have seen the overlocker on their blog. Jaycotts will also be happy to demonstrate other models to you if you visit them. 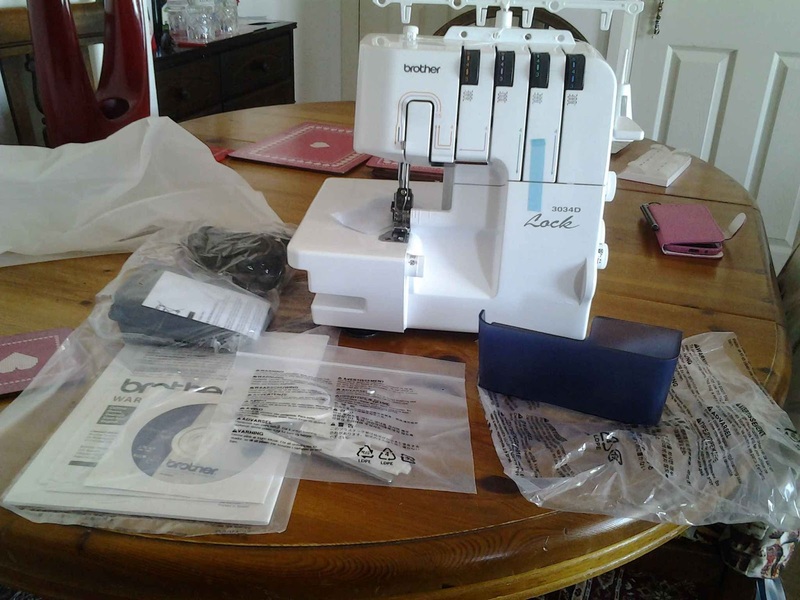 Once you get your new overlocker or sewing machine home don't be in too much of a rush to unpack it. Wait until you know that you will not be disturbed for an hour or two and then carefully unpack it making sure that nothing is left inside the box. Once everything is unpacked check to make sure that everything has been included in the box, there will be a list inside the Handbook. Make yourself a cup,of tea and sit down to read your manual, please don't be tempted to rush straight in with no idea of what you are doing. There is an Instructional DVD included so watch that too if you are able to. With instruction manual in hand start to follow the instructions for threading the machine. Dont worry if progress is slow the first time you do it. If you follow the Instructions properly then you won't have a problem. I have to say that I found threading this an absolute dream, it is so easy! Now comes the time to see if you have threaded it correctly! Following the instructions put a piece of fabric in place and sew your first overlocked edge. This is the result! 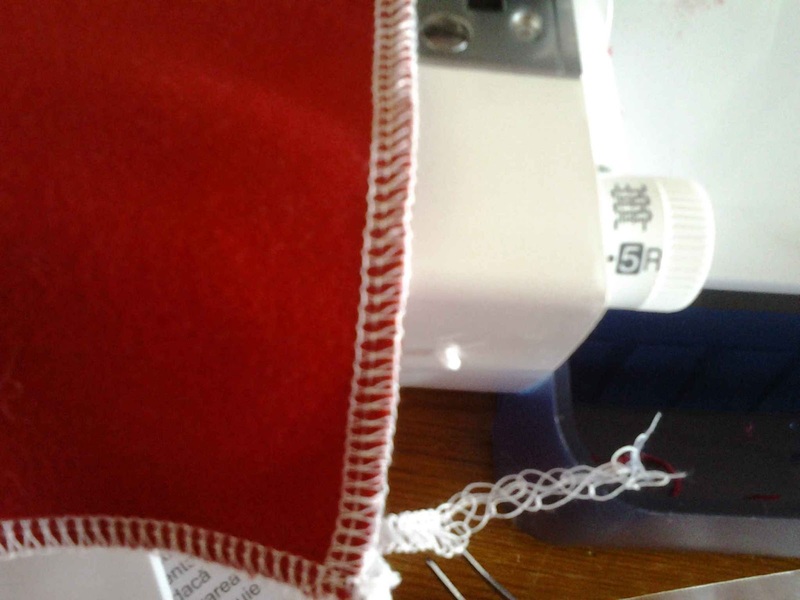 I then unthreaded the machine and did it all over again, doing a test overlock on spare fabric to make sure that I had done it correctly. I had. The machine comes with a blind edge foot which I am really looking forward to using and it does a rolled hem too. I am continuing to experiment with different widths and stitch lengths and I must say that this is the easiest overlocker I have ever used. I am looking forward to using it on a garment and will be blogging about all the different functions in the near future. I want to tell you about future blog posts for Jaycotts.co.uk. one of them being all about zips. 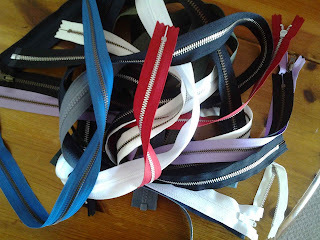 I have a huge selection of zips of all kinds and in all colours and sizes. Jaycotts sell lots of zips, it is one of their specialities so I will be blogging about how to insert concealed zips, exposed zips, open end zips and we will cover how to insert a new zip and other uses for zips for example, as a decorative feature. How old were you when you learned to sew? By the age of 8 I was wearing my own hand made clothes to school and when I was a teenager I bought Vogue magazine and copied the designs. Each saturday I would go and buy new fabric and make it up during the week and wear it the following Saturday night. I always dressed in the latest fashions by doing this. When I was much older I studied Tailoring at college and I am actually a qualified Tailor. It was my Grandmother Annie who first taught me to sew and I feel that this is such an invaluable skill that we really ought to be teaching our sons and daughters to sew. I am pleased to tell you therefore that I will be doing a series of blogs aimed at children to hopefully inspire them to at least make basic garments. 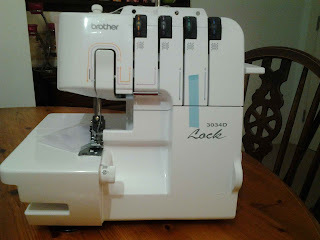 The blogs will cover basic skills such as choosing patterns, measuring, cutting out, sewing a garment together and so on.Dont worry if your child does not have a sewing machine, everything will be made in minature and I will be showing how to do some hand stitching in addition to how to use a sewing machine. 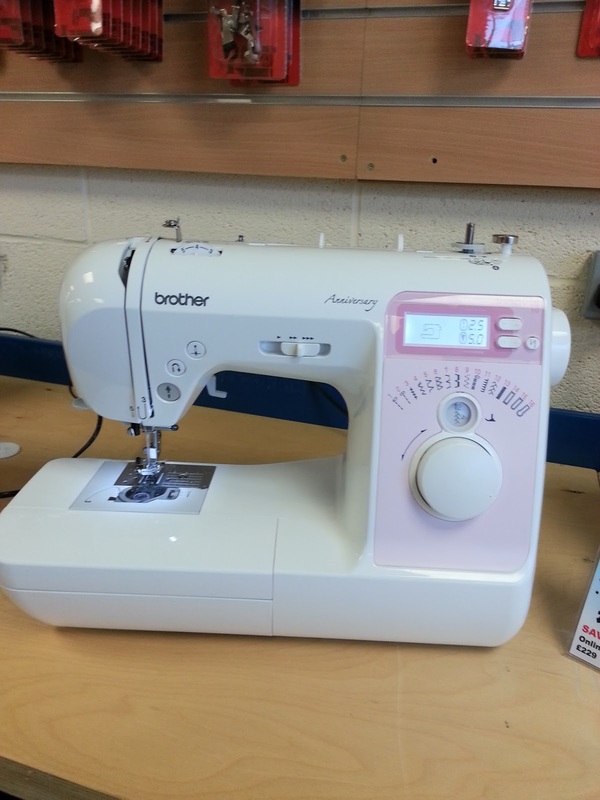 If you do want to purchase your child a sewing machine then I recommend this one. It is a Brother Innov-is 10A and isn't it pretty? Again, it is on the web site and you can take a look at it by clicking on the link HERE if you want more details, or want to talk about other machines then do give Jaycotts a call and they will be very happy to help. People seem to struggle with buttonholes despite most sewing machines having an inbuilt buttonhole maker. So, to help address this I am going to show you an alternative - non sew buttons! 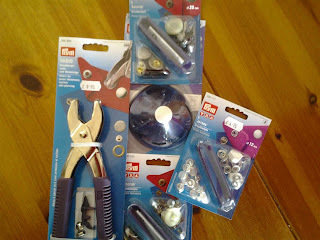 Jaycotts have a variety of tools to enable you to attach some very attractive poppers. To,prove just how attractive they are I will be showing you how to make a button through skirt and a tailored jacket! They will also be used in the series of blogs aimed at children. So do take a look at the selection of tools and non sew poppers on this page HERE and think of all the uses you could put them to. This is Alex Jaycott demonstrating my new overlocker in the Chester store. Just look at the bank of sewing threads behind him! I must tell you a story, it is apropriate I promise you! After we left Jaycotts on Friday we headed to Sheffield. Unfortunately we got stuck in a snow drift. Eventually we were freed and headed on towards Sheffield by a different route. On a happier note I do hope that you will enjoy my future blog posts and that you will be able to help a young person learn to sew. We have so many crafts in this country which are in danger of being lost if we do not take our part in passing them on. Sewing is so rewarding and it would delight me to know that some more people were taking up this hobby.